This is another great homemade pizza but a failed attempt at recreating the Maui Zaui sauce recipe. 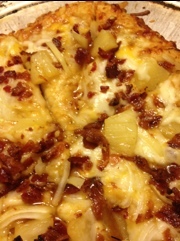 We love Round Table Pizza’s Maui Zaui pizza with Polynesian Sauce. It’s a little sweet, a little spicy. Maybe citrusy? Never has recreating a recipe been quite so difficult for me! Today I tried about 1/2 cup each orange and pineapple juice, a little brown sugar, ginger, soy sauce, chopped garlic, chili powder & red pepper. Reduced until thick and sticky. It was good sauce, it just wasn’t the right sauce. I’d love to hear comments from others who have tried to re-create this sauce! Tags: polynesian sauce. Bookmark the permalink.